My little girl and nephew had been down with the cold bug for a few weeks now. Her cough was quite bad two days ago and we ended up doing a u-turn at kindy. She ate her bento at home instead. 🙂 The above bento made on Friday consist of a sweet potato vegetarian char-siu bun. The bun is really tasty as it’s made from sweet potato and not the usual flour. As for the filling, sorry, but I still prefer the real char-siu ones. 😀 Made a part piggy on top of the bun to show it’s meant to be “porky” bun. 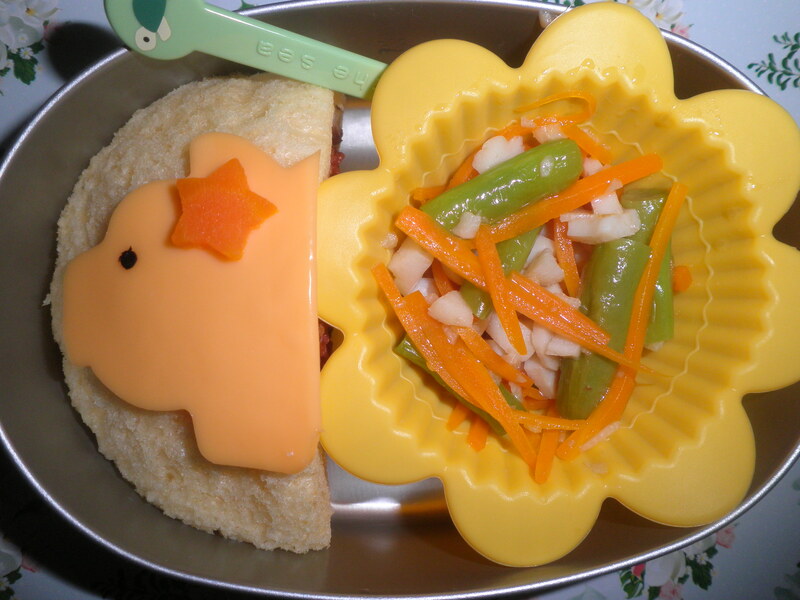 There’s no fruits in this bento as they are both taking chinese medicine and had been advised by the sinseh a.k.a. chinese doctor to refrain from taking any fruits. So to make up for the lost of vitamins and fiber, I cooked some long beans and carrot with some fish balls. Well…once again, fish ball and bits of carrots were consumed but not the long beans. Sigh….. It had been a busy week as I needed to close a great big chapter in my career life to move on to something more challenging. Now that the closure had been finalized, I can now sit down, relax, have a cuppa coffee and update the bentos that I made during the “missing in action” week. Here it goes, all in one shot! 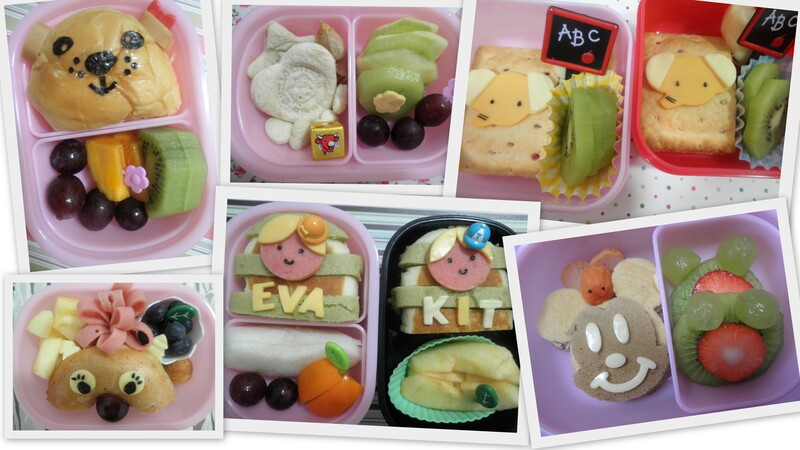 All the above bentos were made for my princess and nephew. Five were made by me, and one was made by my SIL. Guess which one? The Mickey mouse one! From all of the above, I would like to thank two bento queens for their inspiration and they are Debra of Hapabento and Susan from Hawai’i’s Bento Box. I made my first ham blossom as taught by Debra and two little cheese head as inspired by Susan in her 2nd serving of Hawai’i’s Bento Box Cookbook. Thank you thank you very much!